It can be confusing to know if you’re making the right choices when deciding what to buy. The terms ‘sustainable’, ‘green’, and ‘environmentally friendly’ are common phrases that brands use to market their products, and they can often be misleading for consumers. Greenpeace supports any organisation making genuine commitments to improve their environmental performance. But it is important to be able to see through the greenwash in any industry, including the canned tuna industry. It’s encouraging to see ever-increasing demands for products or services that don’t come with environmental consequences. Since we launched our first Canned Tuna Guide in 2009, thousands of Australians have written to tuna companies demanding they switch to sustainably caught tuna. And they’re listening. In 2017, we had a huge breakthrough which ended destructive fishing practises in the Australian tuna market. Thanks to the efforts of our amazing supporters, all major Australian canned tuna brands are now FAD-free! It must be caught without adversely impacting on other species within the ecosystem – including humans – by removing their food source, accidentally killing them, or damaging their physical environment. As the UN Food and Agriculture’s code of conduct for responsible fisheries states; “management should promote the maintenance of the quality, diversity and availability of fishery resources in sufficient quantities for present and future generations” to benefit from. A sustainable fishery operates in a socially and economically fair manner. FADs are like giant fish magnets, attracting large schools of fish and marine life. They’re often equipped with sonar devices to inform fishing companies when enough marine life is ‘aggregated’ around the FAD. Fishing vessels then scoop up all that’s been drawn in by the FAD in giant nets called purse seine nets. This means fishing vessels do not have to search for fish and are able to fill their holds more quickly. It increases the fishing ‘capacity’ in the tuna fishery, and undermines attempts to limit catches by restricting the number of fishing days. FADs draw in juvenile (undersized) yellowfin and bigeye tuna, along with the mature skipjack tuna that fishing vessels are targeting. As these young fish have not yet matured, they’ve not had a chance to breed. Catching them on a large scale risks reducing the future number of breeding adult tuna, with knock-on consequences on the size of future tuna stocks. This is called ‘growth overfishing’. FADs don’t just attract tuna; a diverse range of other marine species also congregates around them (such as sharks, rays, turtles and other fish species). As a result, FAD catches contain both a greater and more diverse range of other marine life – known as bycatch. By conservative estimates, the bycatch rate of FAD fishing is ten times greater than fishing without FADs. The use of FADs is increasing rapidly and control of their use is extremely difficult. This makes it impossible for scientists to accurately measure tuna numbers and may alter the migratory pattern of tuna which could have further knock-on ecosystem effects. There are proven, alternative fishing methods available now that have a considerably lower impact on marine ecosystems. Parts of the industry are reported to be engaged with researching and developing new FAD designs and technologies to try and mitigate the impacts of FADs in purse seine fisheries. Greenpeace welcomes research into improving the environmental performance of the fishing industry but, so far, sustainable FADs don’t exist. The use of FADs is increasing, as are their consequences. Tuna brands must commit now to ending practices which have an unsustainable impact on the marine environment and make the switch to proven, lower-impact forms of fishing. If companies don’t make the clear commitment to ban FADs, nothing changes at sea. Possible but unavailable technologies and research are not an excuse for inaction when proven alternatives are available now. Currently available and proven environmentally responsible fishing methods include pole & line, trolling, handlines; and free school (or FAD-free) purse seine net fishing. 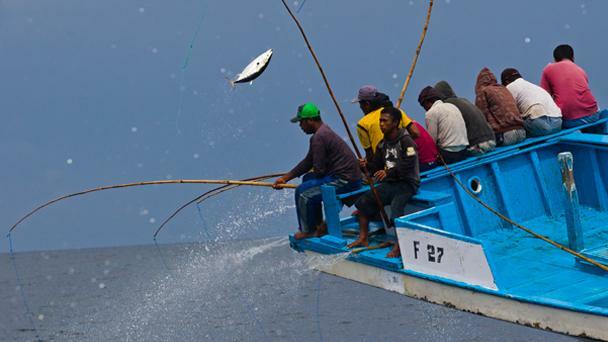 The most sustainable method of catching tuna, when operated according to best practice, is the pole and line method. Each fish is individually caught so it limits the impact on tuna stocks and it’s rare that other species such as turtles or sharks are accidentally caught. Pole and line fishing is also good for local communities because it brings employment opportunities to coastal regions such as our Pacific Island neighbours. The Pacific was once home to a thriving, locally-owned pole and line tuna fishery but more efficient, foreign purse seine fleets eventually drove them out. A few years ago, no Australian tuna brands sold pole and line caught tuna. Today there are a number of pole and line options available at Australian supermarkets thanks to consumer pressure. This includes Safcol, whose entire range is now caught using pole and line. Is aquaculture a solution to overfishing? Aquaculture or fish farming involves farming saltwater species in land-based tanks and ponds, in sea-based cages or nets, or on other similar structures. It has expanded dramatically and is often promoted as a solution to sustainable fisheries. Unfortunately, with the exception of some fish that are herbivores, most aquaculture exacerbates the problem of overfishing and is not sustainable. The main reason is because it doesn’t remove the problem of overfishing, it relocates it down the food chain. Wild fish need to be caught to feed the farmed fish. For example, it takes about 3 tonnes of wild fish to produce 1 tonne of salmon. By fishing this “feed” or smaller fish at industrial levels, simply creates a problem further down the food chain. It can then have even greater problems for ecosystems as other fish species that also feed on these fish species are affected. All the tuna we eat is caught here in our region; most of it from the Pacific ocean. So, every can of tuna that you buy that was caught using sustainable fishing methods, or harvesting a species not-at-risk, is doing a favour for coastal fishers right here in Australia and our neighbours in the Pacific. It’s simple, look for ‘pole and line’ or ‘FAD-free’ canned tuna products and you will be making the right choice for our oceans. Choose skipjack or albacore over yellowfin tuna. Make sure the tuna you buy clearly has the species name, where it was caught, with the fishing method used written clearly on the label. Thankfully, you can now find a great variety of these products in every supermarket in Australia. And if in doubt, refer to the 2017 Greenpeace Canned Tuna Guide!